materials. Incorporates ARMS to ensure precise cutting. Cut decals & other P&C application with ARMS. Includes a range of software applications that improve work efficiency and simplify operations. 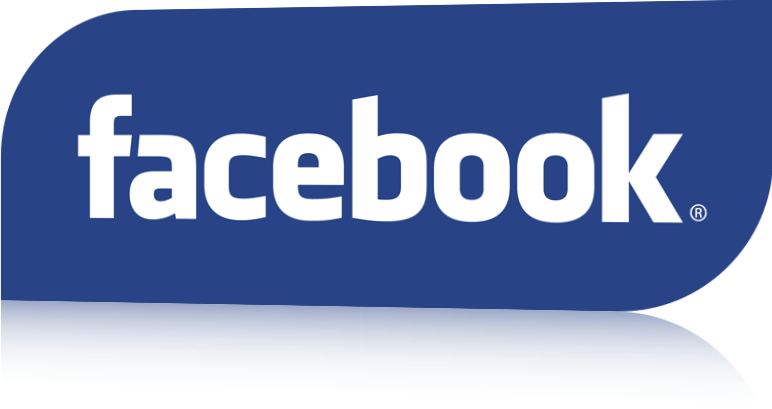 This plug-in software allows direct cutting from graphics applications. For higher productivity, create graphics or text in Adobe Illustrator or CorelDraw, then simply output directly to the plotter. This software reads a DXF file in the AutoCAD R13 format and then enables data display, deleting, sorting, changing of the output order, specification of output setting, and saving functions as well as creation of GP-GL plot data and output to a plotter. Output in separate layers or separate colors can be specified. Output conditions can be selected by layer name or color. 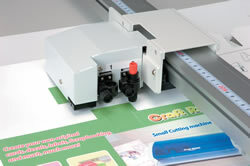 The Weed Border cutting function enables automatic output of a border to facilitate weeding of the cut media. 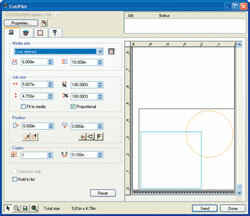 Any drawing exceeding the plotter’s Valid Area can be output in multiple pages using the Tiling function. Output conditions can be managed by media name. The Cutting Simulation function enables checking of the cut sequence, changing of the cut sequence, and tiled cutting prior to actual output. 37.1 x 81.4 x 50.6 in. 66.4 x 81.4 x 39.0 in. approx. 74 kg 163 lbs. *1 A vacuum pump is not provided with VC models. *2 The writing panel on VC models cannot be tilted. *3 HP-GL™ is a registered trademark of the Hewlett-Packard Corporation of the United States. *4 Disposable ink pens cannot be used with the high-force pen. The powerful ARMS (Advanced Registration Mark Sensing system) feature simplifies contour cutting of printed images as well as significantly improving overall productivity for contour cutting items such as labels or stickers.ARMS will automatically read several types of patterns. 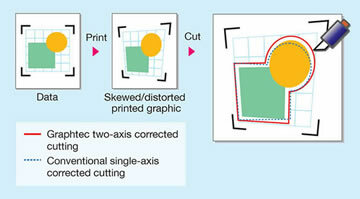 Four-point registration mark sensing and X/Y-axis correction uses high-precision positioning to ensure accurate cutting of graphics that have been skewed or distorted during printed. The intermediate registration marks in horizontal direction are detected to allow four-point correction for each individual segment area. This enables high-precision positioning of the whole area of prints that skewed during printing process. 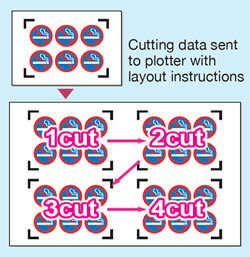 Layout instructions are sent together with the cutting data for designs printed using layout functions such as set in a RIP, enabling continuous detection of registration marks for cutting. This feature is excellent when high accuracy is needed when cutting an array of copies. The first registration mark is detected automatically, eliminating the need to position the head to the registration mark manually. Subsequent registration marks are automatically redetected even if marks are not immediately found, saving the time of starting over. Registration mark commands are provided to control ARMS functions from your software applications such as the Cutting Master 2. Two tools can be mounted at the same time for easy switching. If you mount the cutter plunger and the creasing tool at the same time, you can perform both cutting and scoring operations without having to exchange tools. If you mount a plotter pen, you can draw check plots before commencing the actual cutting. A simple creasing function to create fold lines for clean folding on microflute and cardboard has been enabled. Up to three fold lines can be selected. Spacing between the lines can also be specified. Repeated creasing can also be specified for each line.